Medium (9-22 lbs.) 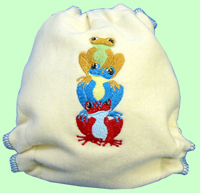 interlock cover with frog trio embroidery. Red snaps/teal thread. Our wool interlock covers are made with 2 layers of felted undyed/untreated wool interlock. These make an excellent nighttime cover and will accomodate a slightly larger size range because of the stretch of the fabric.